Our research group is comparing clinical, histological and molecular healing profiles of oral and skin wounds using human and pig models. The goal is to determine the molecular cues that lead to scarless healing in the oral mucosa and use that information to develop scar prevention therapies for skin and prevent aberrant wound healing in the oral cavity. Wound healing in human and pig palatal mucosa is almost identical, and scar formation is reduced in oral wounds compared with skin. The striking difference between these tissues is transient and rapidly resolving inflammation in oral wounds compared with long-lasting inflammation in the skin wounds. Currently, we are looking at wound transcriptomes (genes differentially regulated) and proteomes (a set of proteins) to investigate how these wound healing responses in skin and oral mucosa are regulated at the molecular level. At the molecular level, the hallmark of scar formation is accumulation of collagen and fibronectin-rich extracellular matrix (ECM) in response to increased activity of transforming growth factor-β1 (TGF-β1) and reduced ECM turnover by fibroblasts.4-6 In scars, collagen fibre bundles are densely packed, abnormally thin and oriented parallel to each other rather than arranged in the basket weave pattern seen in normal tissue. Elastic fibres are fragmented and abnormally organized, and dermal appendages are often missing. Because of these characteristics, scars are less elastic and have only about 70% of the tensile strength of intact skin even after an extended period.7-9 Regardless of their type, scars lead to considerable morbidity. Even small scars in a visible area can have a psychosocial impact on individuals. More excessive scarring may affect mobility (e.g., joint contractures) and cause pain and problems with growth in children. Do Oral Soft Tissue Wounds Heal without Scars? A common impression exists among clinicians that human oral mucosal wounds heal with minimal scar formation compared with skin wounds. There is likely an evolutionary reason for this. Our teeth have developed for grinding food of varying consistencies rather than just swallowing large pieces of prey. Scarring in the oral cavity would have been detrimental to food intake by ancient humans. Scarring of the skin, on the other hand, may be the price we pay for powerful inflammatory reactions against bacterial insults. Figure 1: Human palatal wounds heal quickly with minimal clinical scarring. 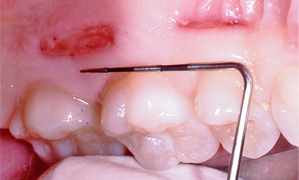 a) Healing of human palatal wounds (10 × 2 mm), 3 days (posterior) and 7 days (anterior) after wounding. b) Healing of the same wounds after 60 days. Various reasons have been suggested for minimal scarring in the oral cavity, including distinct fibroblast phenotype, the presence of bacteria that stimulate wound healing and the moist environment and growth factors present in saliva.25 Animal lovers know that their pets like to lick their wounds, and animal studies have shown that licking and saliva application enhance skin wound healing and reduce inflammation.26-29 This effect of saliva is attributed mainly to its relatively high concentration of epidermal growth factor (EGF), and topical use of artificial saliva has been suggested as a treatment for skin burn wounds.29 Although a number of studies have shown enhanced wound healing when EGF is applied to acute and chronic wounds, the efficacy has been marginal and may require better carriers and sustained-release therapeutics.30 At present, there is very little information regarding the quality of healing (i.e., scar formation) after EGF application, and it is very likely that EGF is not the only factor that promotes wound healing in the oral cavity. In fact, rigorous experimental evidence that demonstrates convincingly and systematically that oral wounds truly heal without scars and with regeneration is still missing. In addition, the influence of tissue site, patient age and other patient-related factors on oral wound healing is largely unknown. Our research team is investigating oral wound healing and comparing it with scar-forming skin wound healing. Our first aim is to provide experimental evidence that oral wound healing results in less scar formation than skin healing. Second, we want to gain a better understanding of the molecular and cellular processes involved in scarless vs. scar-forming wound healing in oral mucosa and skin, respectively. Our ultimate goal is to apply this knowledge to find new ways to promote healing of skin wounds with reduced scar formation. We may then be able to use this information to improve compromised wound healing in the oral cavity, such as soft tissue healing around implants, treatment of peri-implantitis and osteonecrosis of the jaw. We have already analyzed transcriptomes (gene expression profiles) of experimental human palatal wounds. The expression of about 1000 genes is either up-regulated (≥ 2-fold change) or down-regulated (≥ 50% change) 1 day after wounding and about half of that number in 3- and 7-day-old wounds (Table 1). Details will be published elsewhere. To validate the pig model, we recently systematically compared the healing of similar experimental wounds in the oral palatal mucosa in these pigs and in humans. Wounds in both pigs and humans showed similar healing responses and molecular composition over time. Using this model, we showed for the first time that scar formation in oral mucosal wounds is significantly reduced, clinically and histologically, compared with similar skin wounds (Fig. 2).31,32 One of the most striking differences was a rapid but transient inflammatory response in oral wounds compared with a longer-lasting inflammatory reaction in skin wounds. In addition, TGF-β1 signaling was more transient in oral mucosa than in skin. Both these observations suggest that oral wound healing mimics that of fetal skin with reduced scar formation due to the rapidly resolving inflammatory reaction. Furthermore, remodeling of the wound matrix seems to be more rapid in oral wounds, resulting in almost normal tissue architecture by 60 days (the initial size of the wounds was 15 × 27 mm). Although these wounds do not show signs of clinical scar formation at this stage, molecular remodeling is still underway and it remains to be shown when, if ever, the molecular composition is completely normalized. It is also not known whether palatal wounds fully regenerate. In pigs, such regeneration is not evident at 60 days as judged by the lack of reformation of rugae, special developmental structures of the hard palate (Fig. 2). In fact, preliminary clinical evidence from humans suggests that rugae “reroute” rather than “regenerate” (i.e., old rugae will shift position during healing), but long-term results are still missing. Figure 2: Representative clinical (a, c, e, g) and histologic (b, d, f, h) images of red Duroc pig skin (a–d) and oral mucosa (gingiva; e–h) before (a, b, e, f) and 60 days after (c, d, g, h) wounding. In gingiva, wound healing is scarless both clinically (g) and histologically (h) 60 days after wounding, but the rugae have not regenerated (g). At this point, scar formation is evident both clinically (c) and histologically (d) in skin. E = epithelium; CT = connective tissue; SC = scar; WCT = connective tissue that has regenerated in the wound area; RG = rugae. Hematoxylin and eosin staining (b, d, f, h). In summary, we have shown that full-thickness palatal wounds heal with minimal scars in humans and pigs. We have started to analyze and compare molecular aspects of wound healing in oral mucosa and skin to determine the pathways important for scarless healing. In future, this information will be used to develop therapies for the prevention of scar formation in skin after burns, surgical interventions and accidental trauma. Dr. Larjava is professor and chair, division of periodontics, laboratory of periodontal biology, department of oral biological and medical sciences, faculty of dentistry, University of British Columbia, Vancouver, British Columbia. Dr. Wiebe is clinical assistant professor, department of oral biological and medical sciences, faculty of dentistry, University of British Columbia, Vancouver, British Columbia. Dr. Gallant-Behm is research associate, department of molecular, cell and developmental biology, University of Colorado at Boulder, Boulder, Colorado. Dr. Hart is professor, department of surgery and Grace Glaum Professor in Arthritis Research, McCaig Institute of Bone and Joint Health, University of Calgary, Calgary, Alberta. Dr. Heino is professor and head, department of biochemistry, University of Turku, Turku, Finland. Dr. Häkkinen is associate professor, laboratory of periodontal biology, department of oral biological and medical sciences, faculty of dentistry, University of British Columbia, Vancouver, BC. Correspondence to: Dr. Hannu Larjava, Department of oral biological and medical sciences, Laboratory of periodontal biology, Faculty of dentistry, University of British Columbia, 2199 Wesbrook Mall, Vancouver, BC V6T 1Z3. Acknowledgements: Studies were supported by grants from the Canadian Institutes of Health Research and the Sigrid Juselius Foundation. We thank Mrs. Ingrid Ellis for her help in preparing the manuscript and Dr. Tara Habijanic for performing the human wound healing study. Slemp AE, Kirschner RE. Keloids and scars: a review of keloids and scars, their pathogenesis, risk factors, and management. Curr Opin Pediatr. 2006;18(4):396-402. Durani P, Occleston N, O’Kane S, Ferguson MW. Avotermin: a novel antiscarring agent. Int J Low Extrem Wounds. 2008;7(3):160-8. Gangemi EN, Gregori D, Berchialla P, Zingarelli E, Cairo M, Bollero D, et al. Epidemiology and risk factors for pathologic scarring after burn wounds. Arch Facial Plast Surg. 2008;10(2):93-102. Ghahary A, Ghaffari A. Role of keratinocyte-fibroblast cross-talk in development of hypertrophic scar. Wound Repair Regen. 2007;15(Suppl 1):S46-53. Erratum in Wound Repair Regen. 2008;16(4):582. Verrecchia F, Mauviel A. Transforming growth factor-beta and fibrosis. World J Gastroenterol. 2007;13(22):3056-62. Armour A, Scott PG, Tredget EE. Cellular and molecular pathology of HTS: basis for treatment. Wound Repair Regen. 2007(Suppl 1);15:S6-17. Erratum in Wound Repair Regen. 2008;16(4):582. Clark RAF. Overview and general considerations of wound repair. In: The molecular and cellular biology of wound repair. New York: Plenum, 1996; p. 3-33. Breathnack SM, McGrath JA. Wound healing. In: Burns T, Breathnach S, Cox N, Griffiths C, editors. Rook’s textbook of dermatology. 7th ed. Oxford: Blackwell Science Ltd; 2004. p. 11.1-11.25. Häkkinen L, Csiszar A. Hereditary gingival fibromatosis: characteristics and novel putative pathogenic mechanisms. J Dent Res. 2007;86(1):25-34. Bayat A, McGrouther DA, Ferguson MW. Skin scarring. BMJ. 2003;326(7380):88-92. Metcalfe AD, Ferguson MW. Tissue engineering of replacement skin: the crossroads of biomaterials, wound healing, embryonic development, stem cells and regeneration. J R Soc Interface. 2007;4(14):413-37. Occleston NL, O’Kane S, Goldspink N, Ferguson MW. New therapeutics for the prevention and reduction of scarring. Drug Discov Today. 2008;13(21-22):973-81. Epub 2008 Oct 15. Bombaro KM, Engrav LH, Carrougher GJ, Wiechman SA, Faucher L, Costa BA. et al. What is the prevalence of hypertrophic scarring following burns? Burns. 2003;29(4):299-302. Ferguson MW, O'Kane S. Scar-free healing: from embryonic mechanisms to adult therapeutic intervention. Philos Trans R Soc Lond B Biol Sci. 2004;359(1445):839-50. Armstrong JR, Ferguson MW. Ontogeny of the skin and the transition from scar-free to scarring phenotype during wound healing in the pouch young of a marsupial, Monodelphis domestica. Dev Biol. 1995;169(1):242-60. Martin P, Leibovich SJ. Inflammatory cells during wound repair: the good, the bad and the ugly. Trends Cell Biol. 2005;15(11):599-607. Epub 2005 Oct 3. Eming SA, Krieg T, Davidson JM. Inflammation in wound repair: molecular and cellular mechanisms. J Invest Dermatol. 2007;127(3):514-25. Bullard KM, Longaker MT, Lorenz HP. Fetal wound healing: current biology. World J Surg. 2003;27(1):54-61. Fang RC, Mustoe TA. Animal models of wound healing: utility in transgenic mice. J Biomater Sci Polym Ed. 2008;19(8):989-1005. Michalopoulos GK, DeFrances MC. Liver regeneration. Science. 1997;276(5309):60-6. Stoick-Cooper CL, Moon RT, Weidinger G. Advances in signaling in vertebrate regeneration as a prelude to regenerative medicine. Genes Dev. 2007;21(11):1292-315. Szpaderska AM, Zuckerman JD, DiPietro LA. Differential injury responses in oral mucosal and cutaneous wounds. J Dent Res. 2003;82(8):621-6. Schrementi ME, Ferreira AM, Zender C, DiPietro LA. Site-specific production of TGF-beta in oral mucosal and cutaneous wounds. Wound Repair Regen. 2008;16(1):80-6. Epub 2007 Dec 13. Chen L, Arbieva ZH, Guo S, Marucha PT, Mustoe TA, DiPietro LA. Positional differences in the wound transcriptome of skin and oral mucosa. BMC Genomics. 2010;11:471. Häkkinen L, Uitto VJ, Larjava H. Cell biology of gingival wound healing. Periodontology 2000. 2000;24:127-52. Hart BL, Powell KL. Antibacterial properties of saliva: role in maternal periparturient grooming and in licking wounds. Physiol Behav. 1990;48(3):383-6. Varshney AC, Sharma DN, Singh M, Sharma SK, Nigam JM. Therapeutic value of bovine saliva in wound healing: a histomorphological study. Indian J Exp Biol. 1997;35(5):535-7. Hutson JM, Niall M, Evans D, Fowler R. Effect of salivary glands on wound contraction in mice. Nature. 1979;279(5716):793-5. Jahovic N, Güzel E, Arbak S, Yeğen BC. The healing-promoting effect of saliva on skin burn is mediated by epidermal growth factor (EGF): role of the neutrophils. Burns. 2004;30(6):531-8. Hardwicke J, Schmaljohann D, Boyce D, Thomas D. Epidermal growth factor therapy and wound healing — past, present and future perspectives. Surgeon. 2008;6(3):172-7. Mak K, Manji A, Gallant-Behm C, Wiebe C, Hart DA, Larjava H, et al. Scarless healing of oral mucosa is characterized by faster resolution of inflammation and control of myofibroblast action compared to skin wounds in the red Duroc pig model. J Dermatol Sci. 2009;56(3):168-80. Epub 2009 Oct 24. Wong JW, Gallant-Behm C, Wiebe C, Mak K, Hart DA, Larjava H, et al. Wound healing in oral mucosa results in reduced scar formation as compared with skin: evidence from the red Duroc pig model and humans. Wound Repair Regen. 2009;17(5):717-29. Wang JF, Olson ME, Reno CR, Kulyk W, Wright JB, Hart DA. Molecular and cell biology of skin wound healing in a pig model. Connect Tissue Res. 2000;41(3):195-211. Wang JF, Olson ME, Reno CR, Wright JB, Hart DA. The pig as a model for excisional skin wound healing: characterization of the molecular and cellular biology, and bacteriology of the healing process. Comp Med. 2001;51(4):341-8. Sullivan TP, Eaglstein WH, Davis SC, Mertz P. The pig as a model for human wound healing. Wound Repair Regen. 2001;9(2):66-76. Gallant CL, Olson ME, Hart DA. Molecular, histologic, and gross phenotype of skin wound healing in red Duroc pigs reveals an abnormal healing phenotype of hypercontracted, hyperpigmented scarring. Wound Repair Regen. 2004;12(3):305-19. Zhu KQ, Carrougher GJ, Gibran NS, Isik FF, Engrav LH. Review of the female Duroc/Yorkshire pig model of human fibroproliferative scarring. Wound Repair Regen. 2007;15(Suppl 1):S32-9. Gallant-Behm CL, Hildebrand KA, Hart DA. The mast cell stabilizer ketotifen prevents development of excessive skin wound contraction and fibrosis in red Duroc pigs. Wound Repair Regen. 2008;16(2):226-33. Ramos ML, Gragnani A, Ferreira LM. Is there an ideal animal model to study hypertrophic scarring? J Burn Care Res. 2008;29(2):363-8.